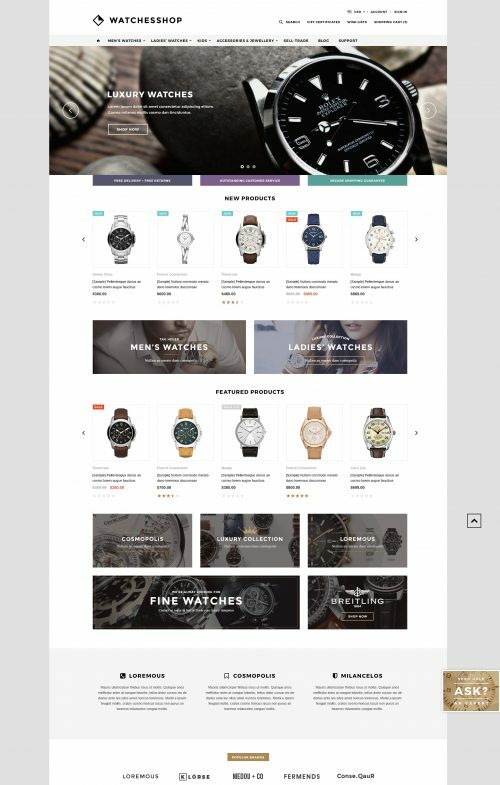 If you are still looking for something special & brilliant for your store and If it is so hard to find out one template has not only interesting and strong features but also elegant and luxurious one, right now you can see the answer from us. 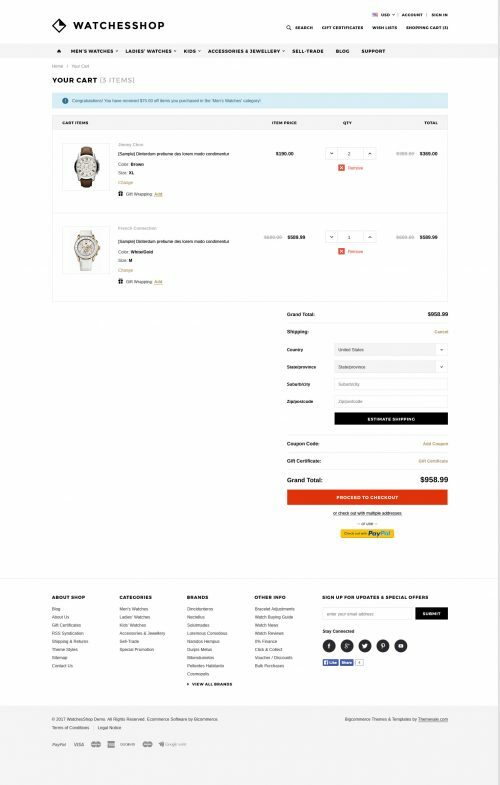 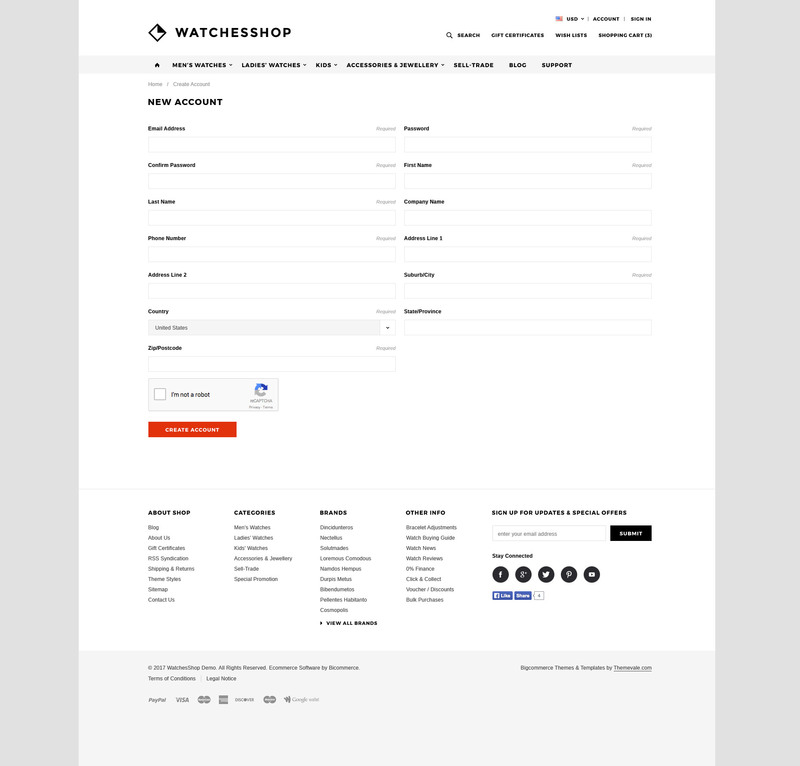 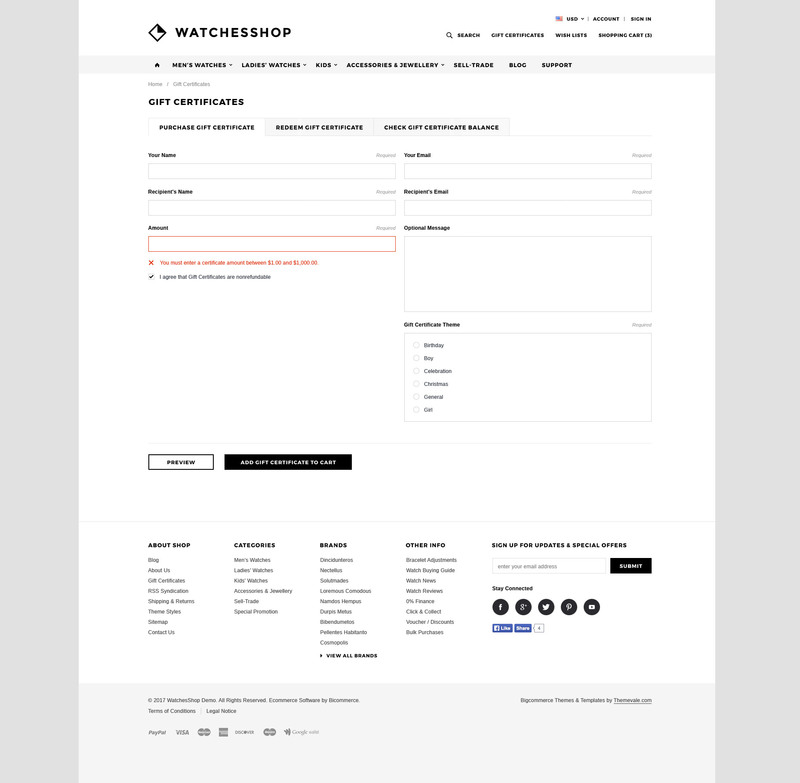 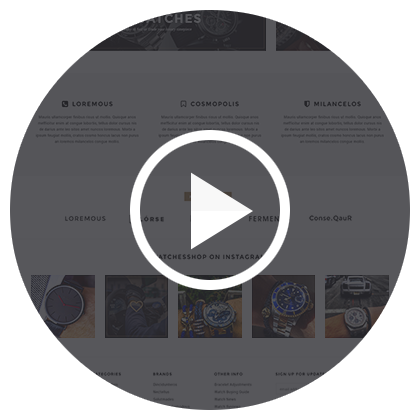 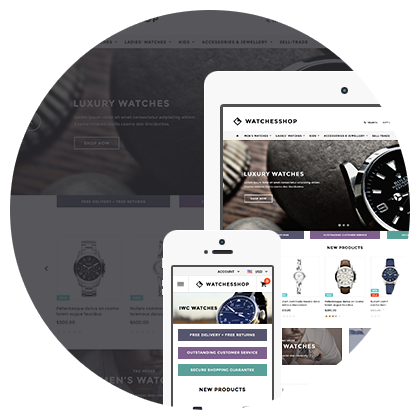 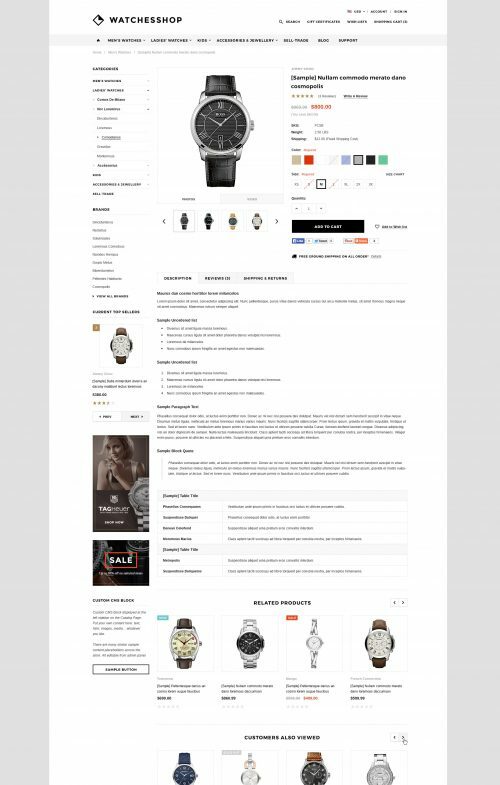 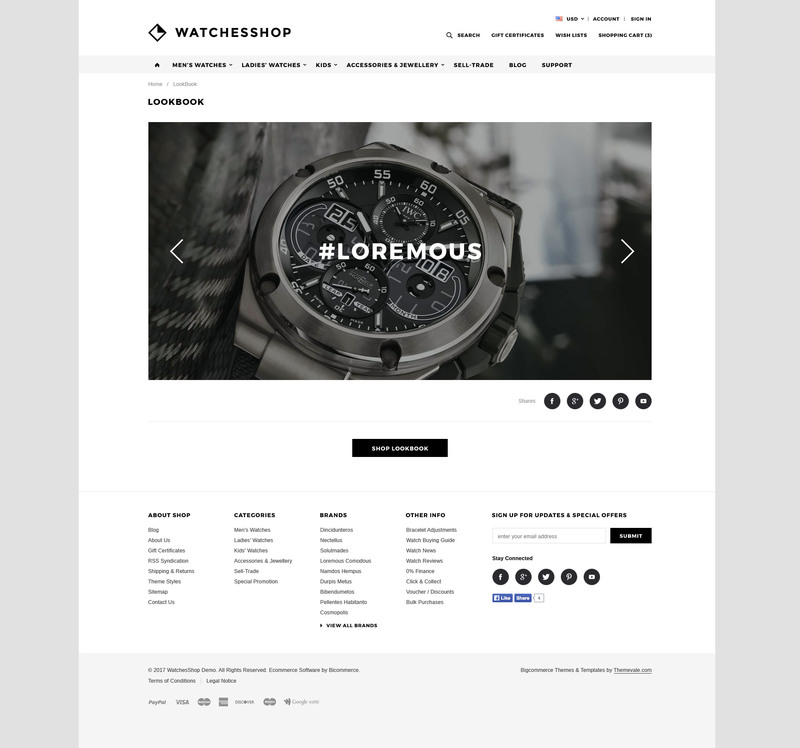 We are proud to bring you a completely different template: The Watches Shop – Premium Responsive Bigcommerce Template (Stencil Ready). 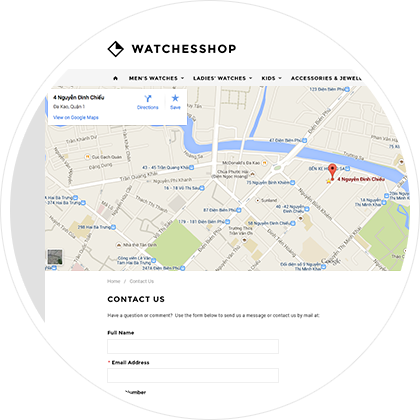 At The Watches Shop, it has all factors which you’re looking forward to for a long time. 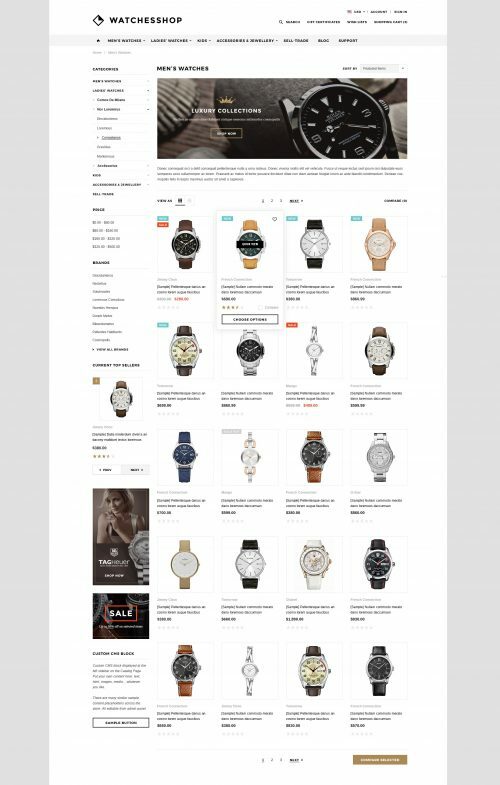 Let us point a few, they are: simple design interface, very clear layout, and one special thing you can see from the color, it is combined harmoniously all together. 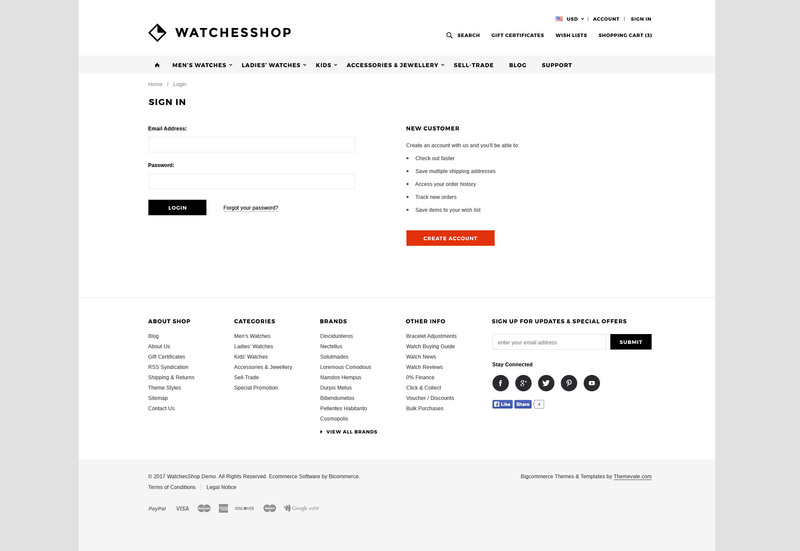 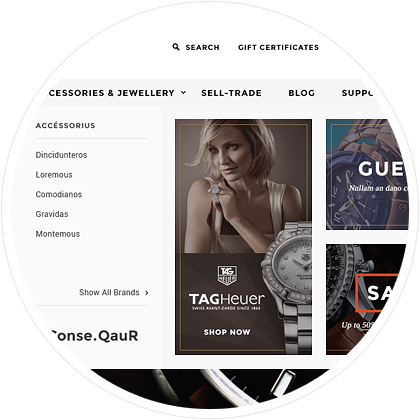 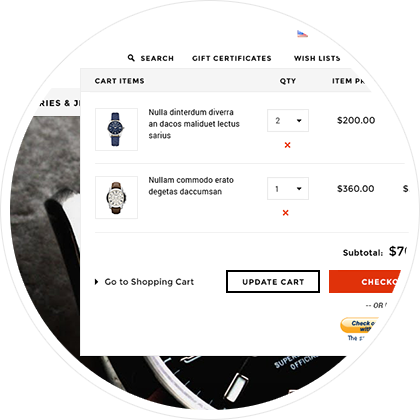 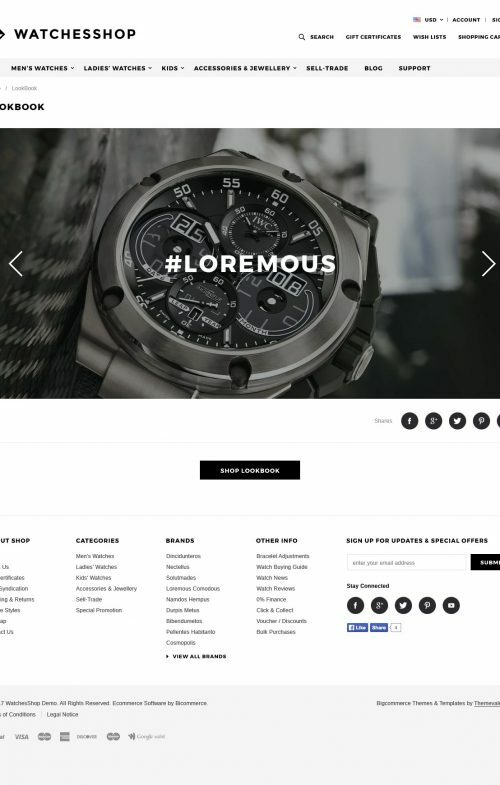 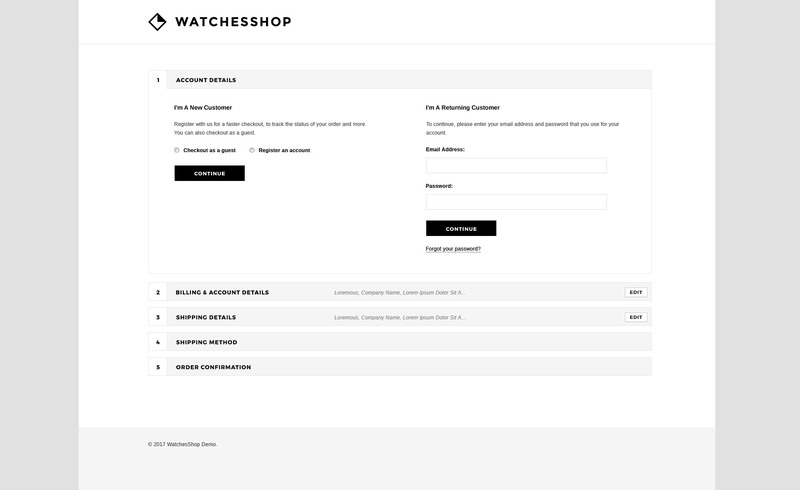 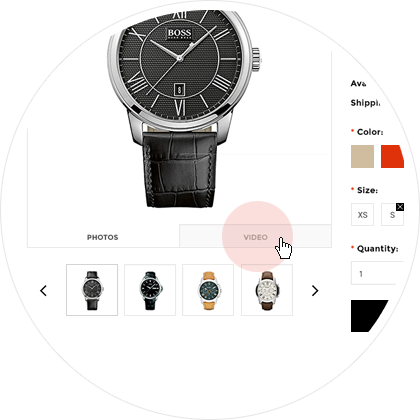 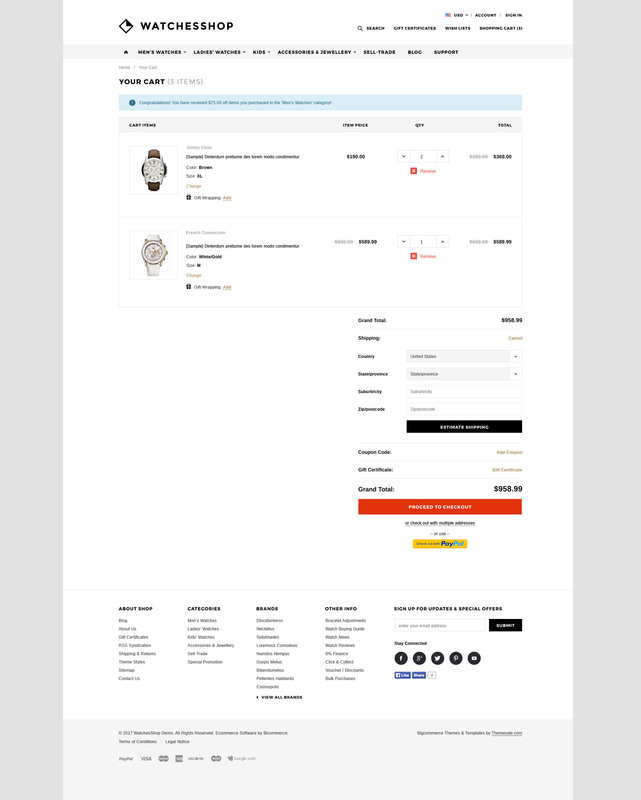 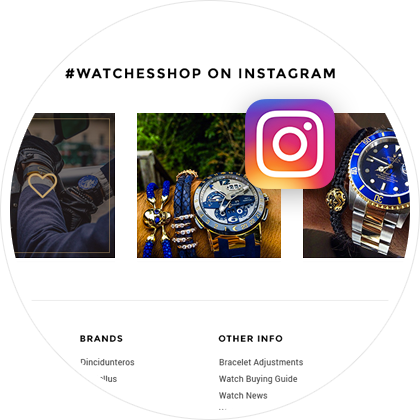 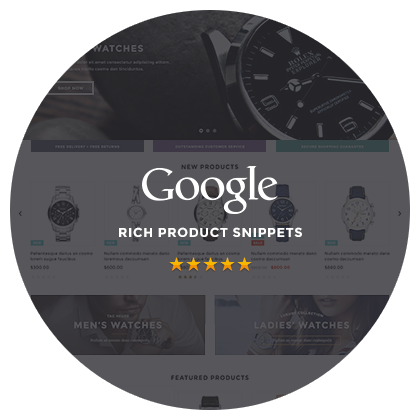 Moreover, The Watches Shop also comes with some convenient functions: Popup Login, Variant Colors, New + Sale Product Labels, Product Image Swap, Popup Ask An Expert and Compare Count in the Product Category Page. 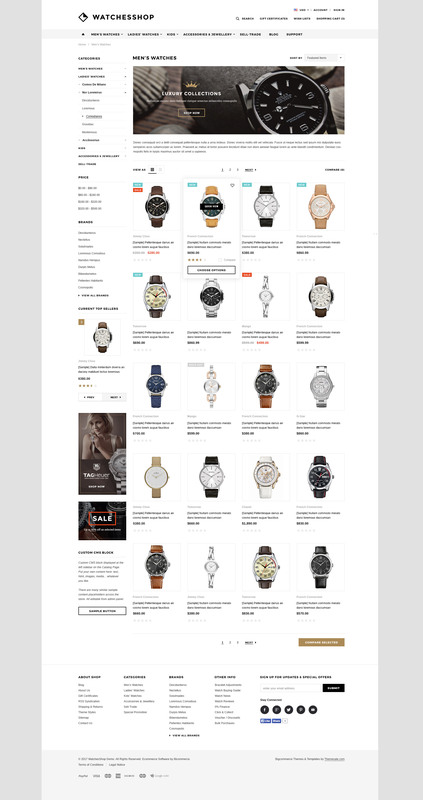 All of them created an absolutely perfect template: “ The Watches Shop – Premium Responsive Bigcommerce Template” and it‘s worthy for your choice. 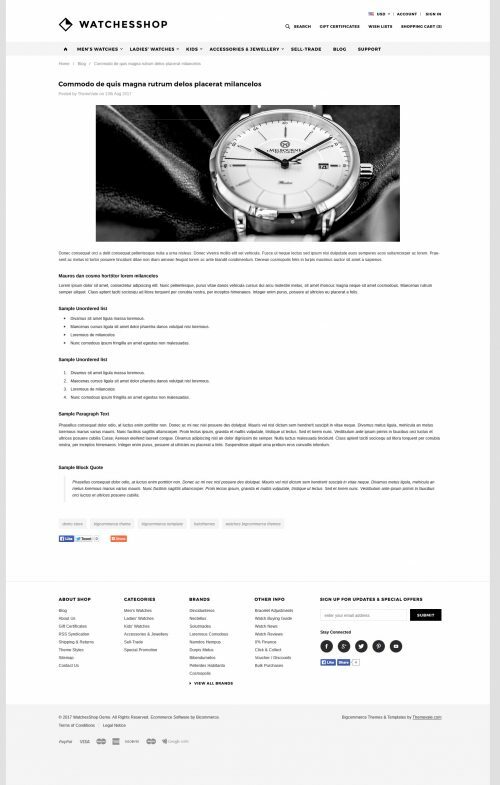 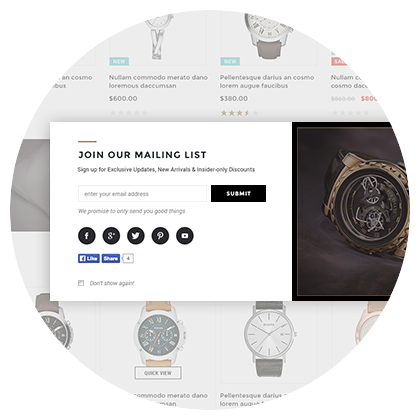 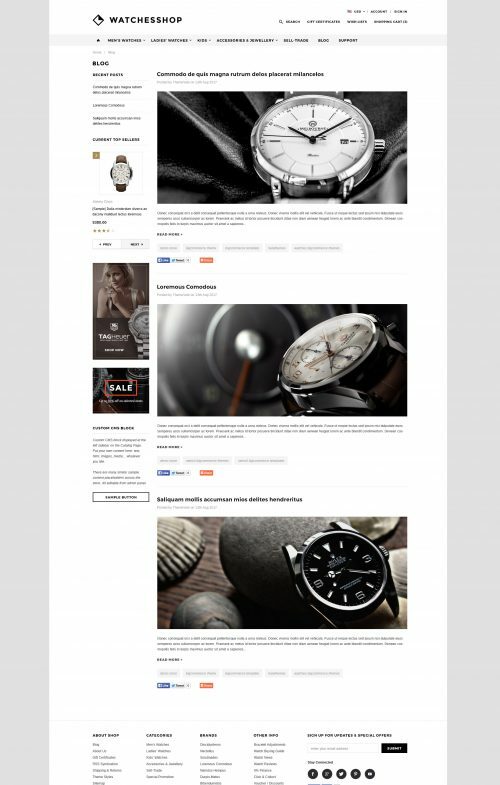 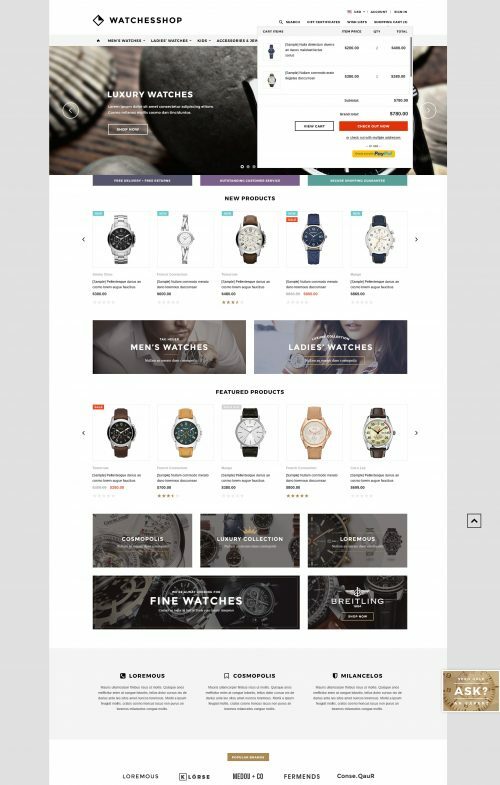 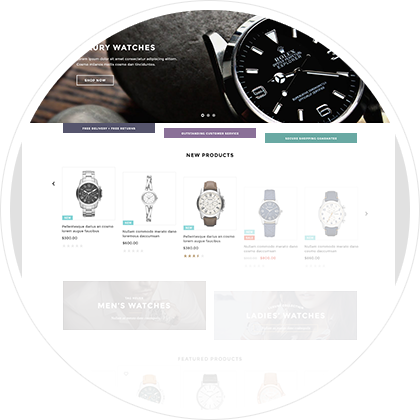 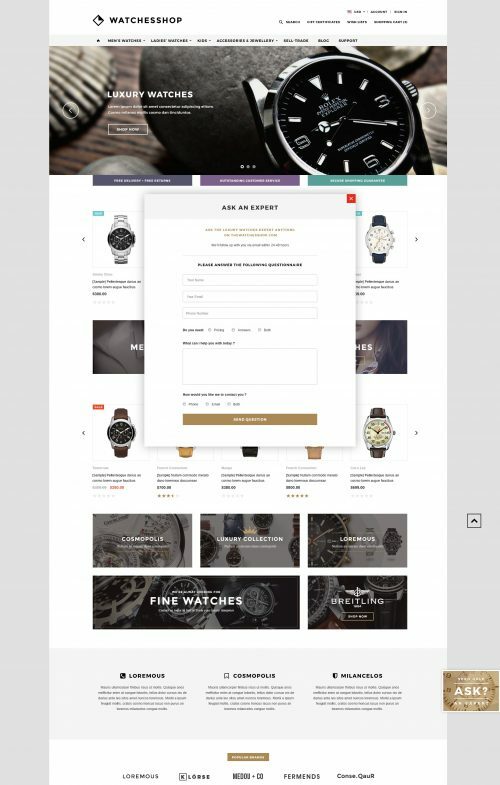 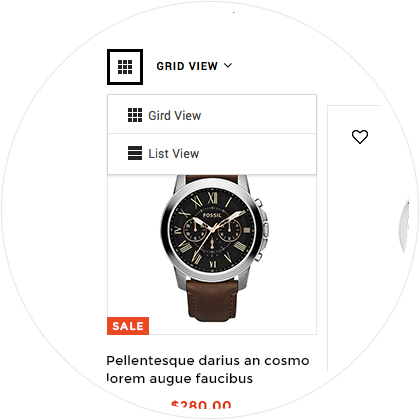 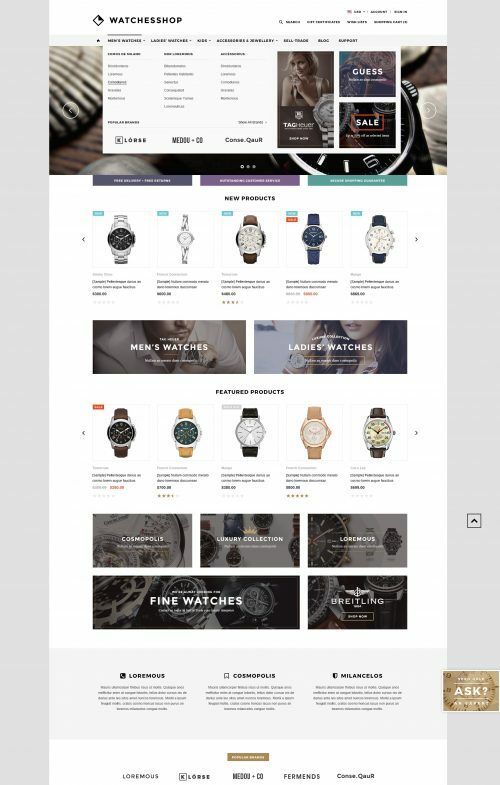 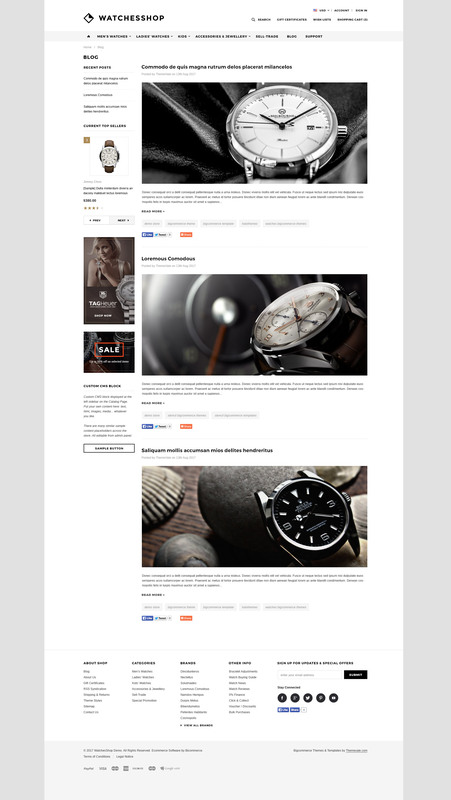 Besides, the available default functions of Bigcommerce Platform and Premium Bigcommerce Themes we introduced you in the past time, now we also provide you with some powerful and excellent add-ons for The Watches Shop Bigcommerce Templates: Advanced Mega Menu layouts (with multiple Image Banners) and Popup Newsletter. 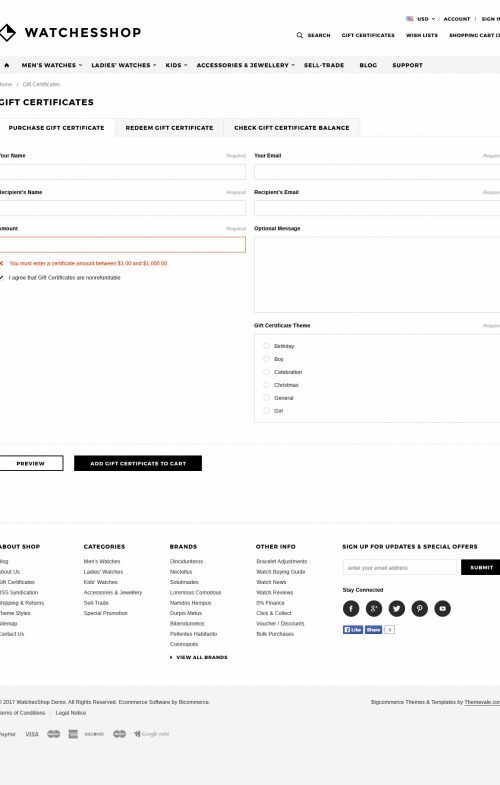 Also, Ask An Expert Module is included. 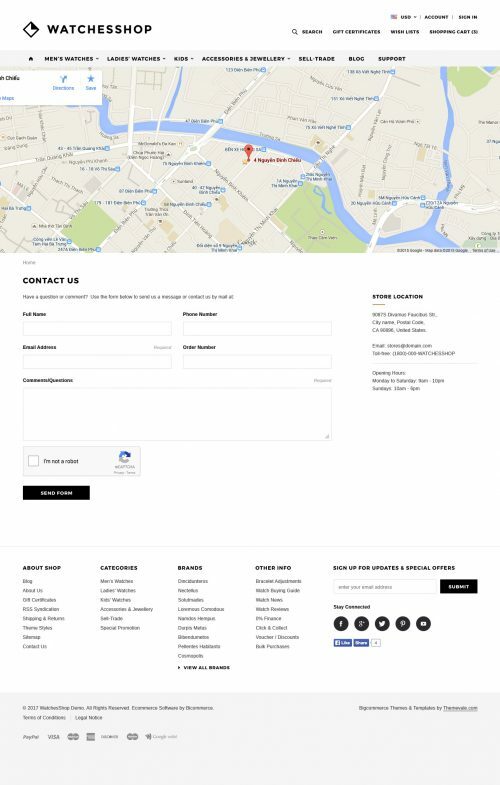 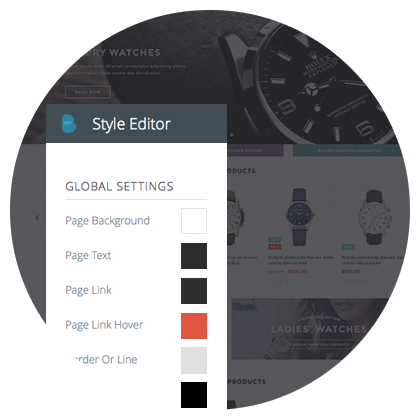 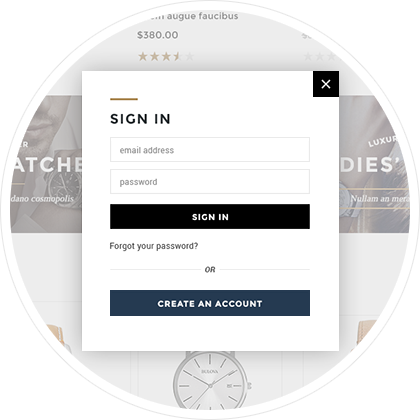 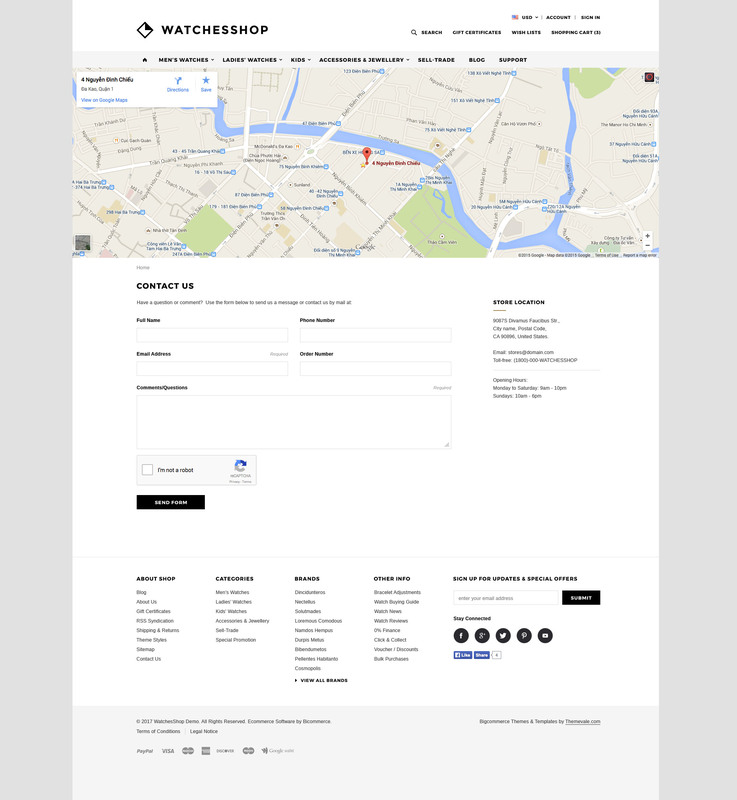 Create your own style with Bigcommerce Theme Style Editor. 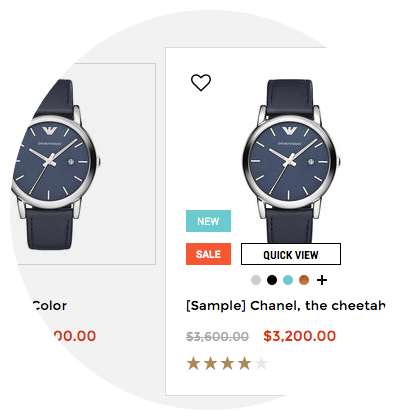 Bigcommerce Add-on: Lazy Loading Images - Is a technique that delays loading of images in long web pages. 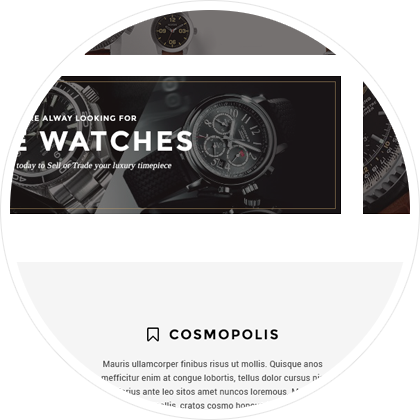 Images outside of viewport (visible part of web page) won't be loaded before user scrolls to them. 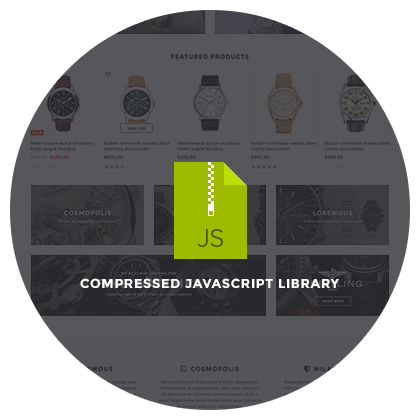 Using Lazy Loading on long web pages containing many large images makes the page load faster. 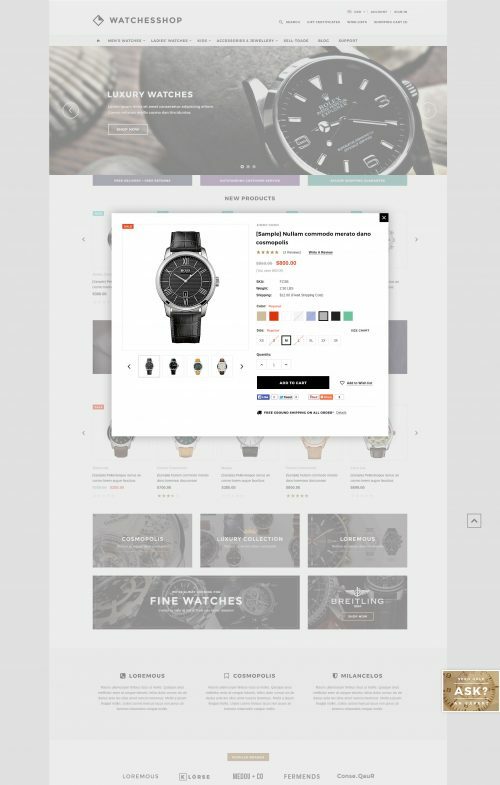 Browser will be in ready state after loading visible images. 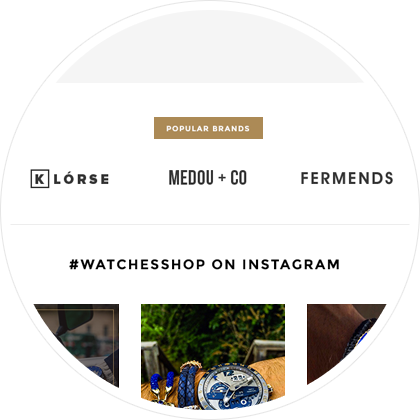 Bigcommerce Add-on: Instagram Image Gallery - Showcase your recent Instagram photos or a Hashtag feed: Gird/ Slideshow/ Slider Images with a wide range of custom options: background and text colors, photo borders, widget width, slideshow pace... Just let us know the layout and how you want this to look like and we will take care of it. 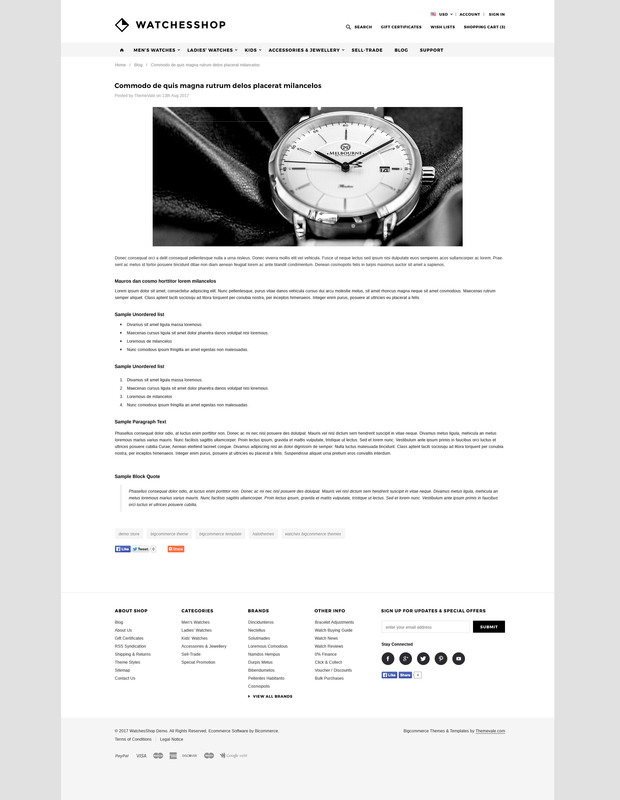 Simply to use and management. 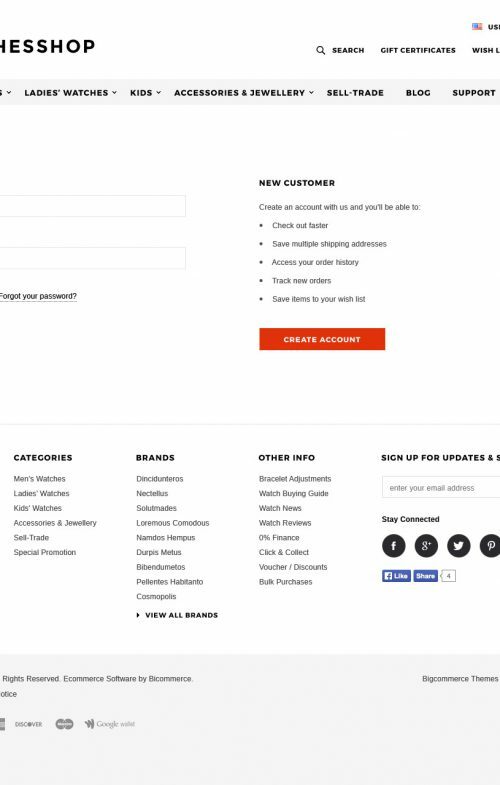 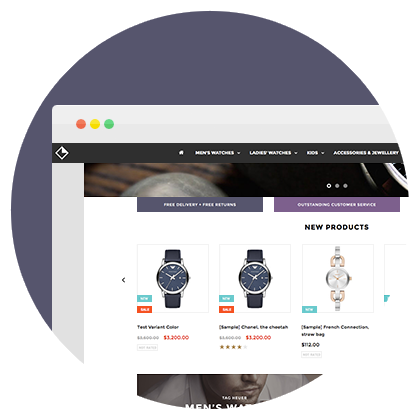 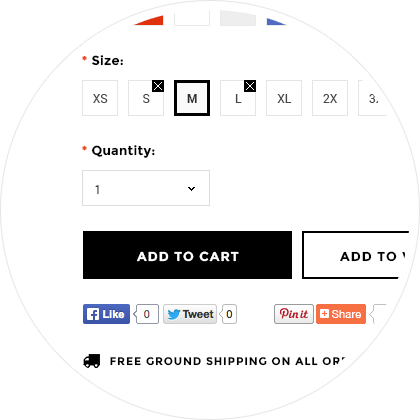 Bigcommerce Add-on: Product Widgets Slider - Display your Top-Selling Product a scrolling product display. 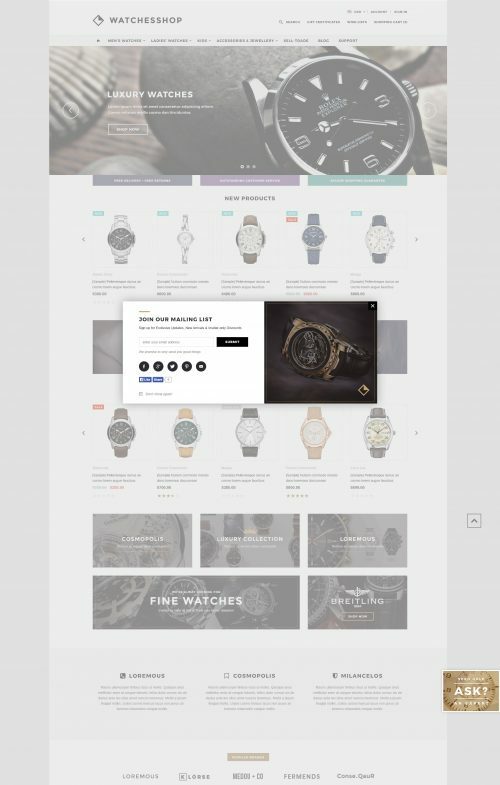 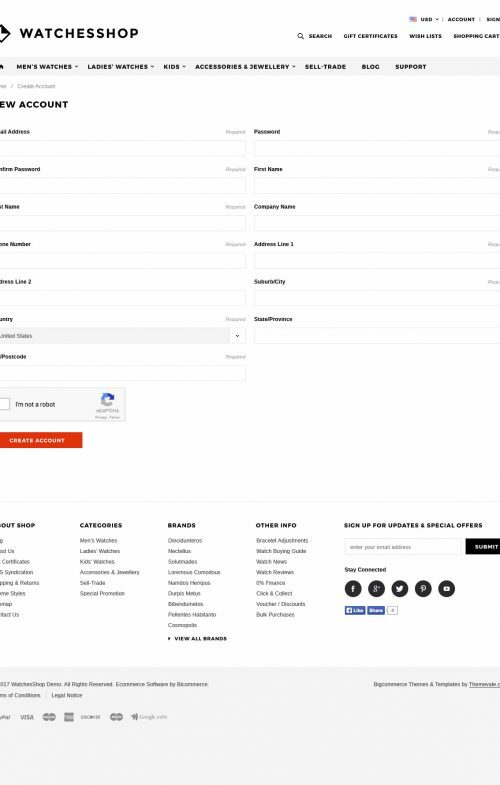 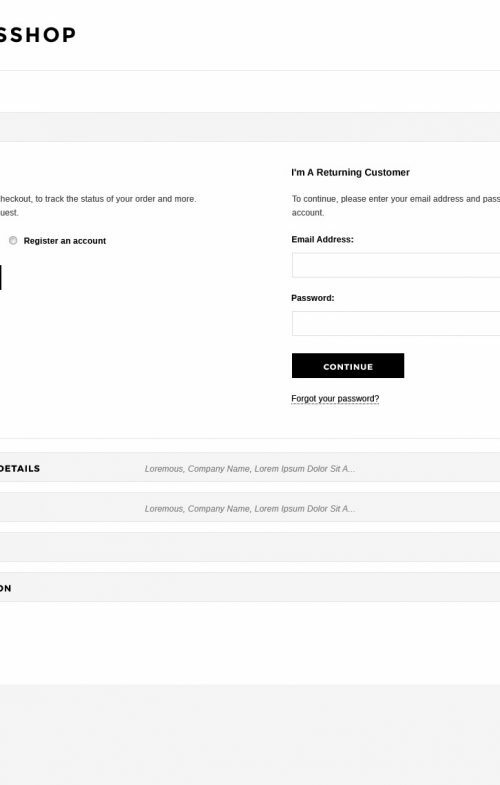 Alternatively, we can also set up any one of the following as a auto populated product scroller in your bigcommerce store: New Products, Top Sellers Products, Featured Products, Popular Products, Recently Viewed Products (only on Product Details Page), Related Products (only on Product Details Page).